Triax stole the rocket boots idea from Spock in Star Trek 5! 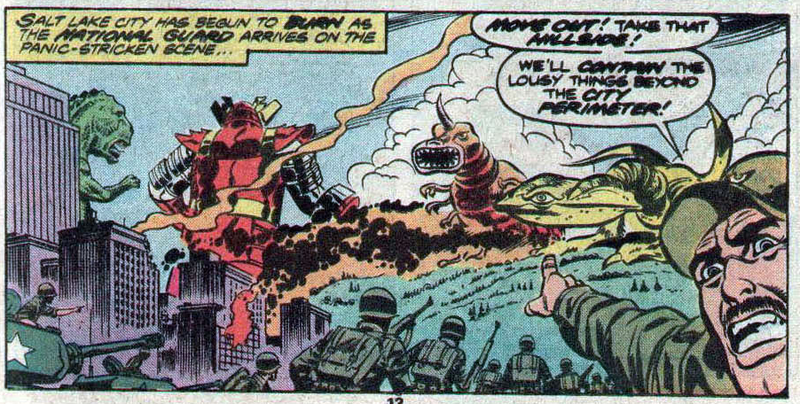 When last we left Godzilla, he was kidnapped by aliens and told that he’s about to get used as an intergalactic Pokemon! 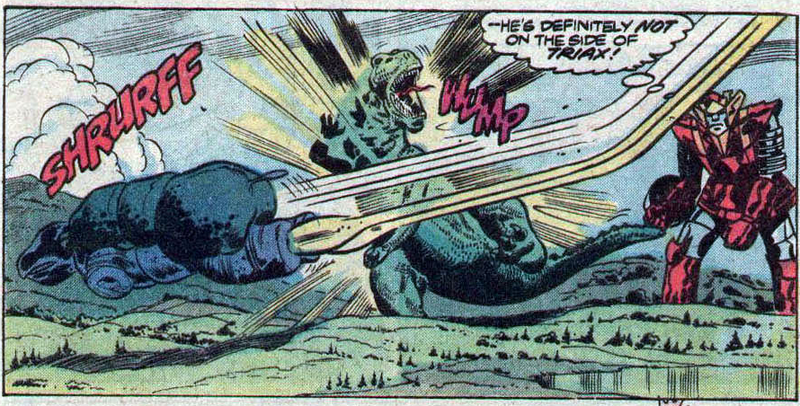 Godzilla wasn’t too pleased, but he was less pleased with the jerkoff evil monster Triax, who showed up to beat him up. Triax will soon be joined by his two buddies and we’ll be off at the races. If you need catching up on the who what and wheres, check out the Godzilla Marvel Splash Page, and yes, March of Godzilla 2013 is marching into June! Triax looks like a rhino that forgot his horn and instead put his eyes on stalks. Luckily for us, he also has rocket thrusters on the bottom of his feet, allowing him to fly around like he’s Iron Man or something. 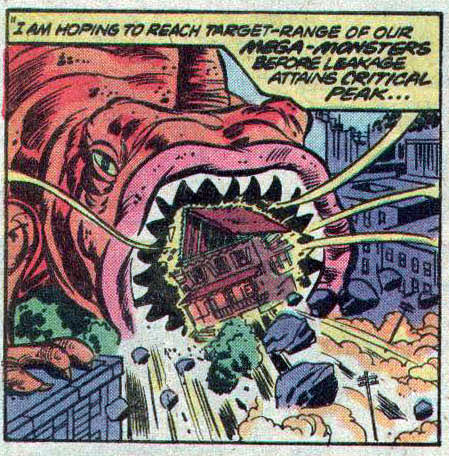 Triax is also arrogant and leaves psychic taunts, except for when the taunts are coming from the Megan controllers, at which point I just assume the writer wasn’t paying attention. Fellow Mega-monster Krollar looks like a giant red Leech toy from Master of the Universe, with a horn on his head and the ability to burrow underground (Hello, Baragon!) Krollar does one better by eating dirt and crap and spitting it back out as a weapon. Krollar is a giant flying green monster with dinner plates for jaws and a tail that turns into a helicopter blade. 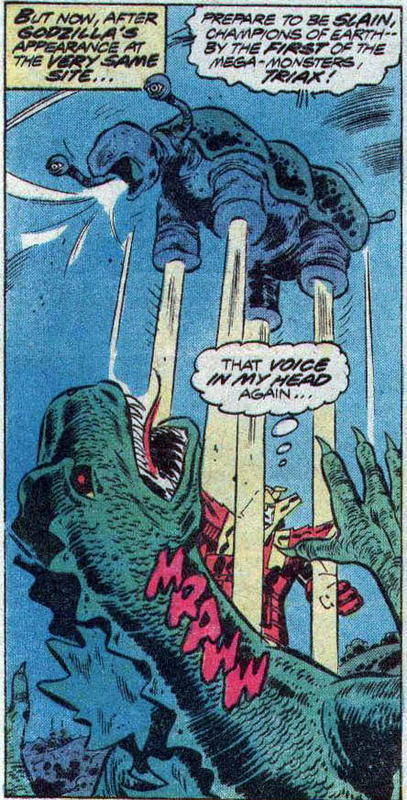 He was altered by the Megans and is a “Biomech”, something the Megans have to remind Krollar of, because he’s too stupid to realize he’s now a freak of nature. Alien nature. Krollar has only one eye, because the last thing you want a flying monster to have is depth perception. 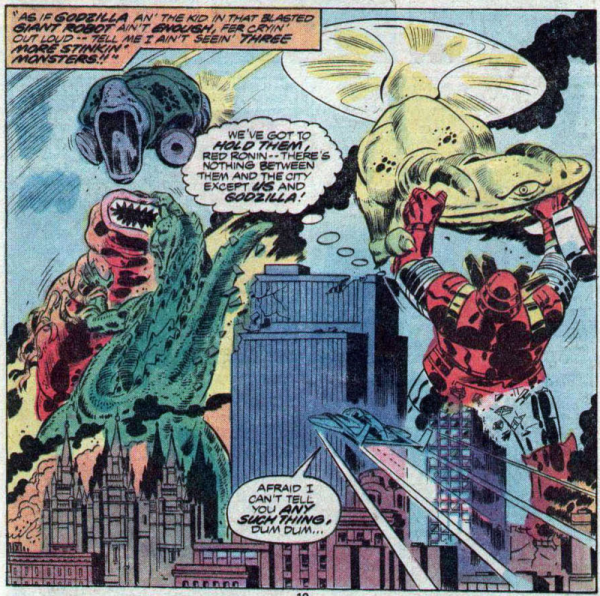 Triax in the mood for slaughter (and refers to himself as the “first” of the monsters…) He has hover jets on the bottom of his feet, and can transform into a sleeker flying attack mode to battle both Godzilla and Red Ronin. 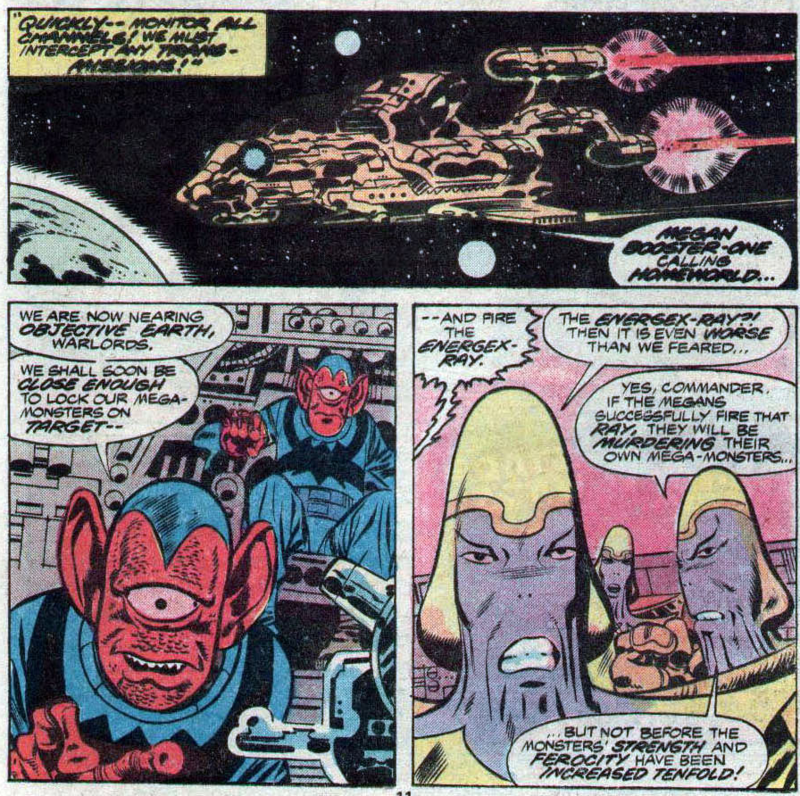 The Megans spend their time taunting Robby with psychic babbling. 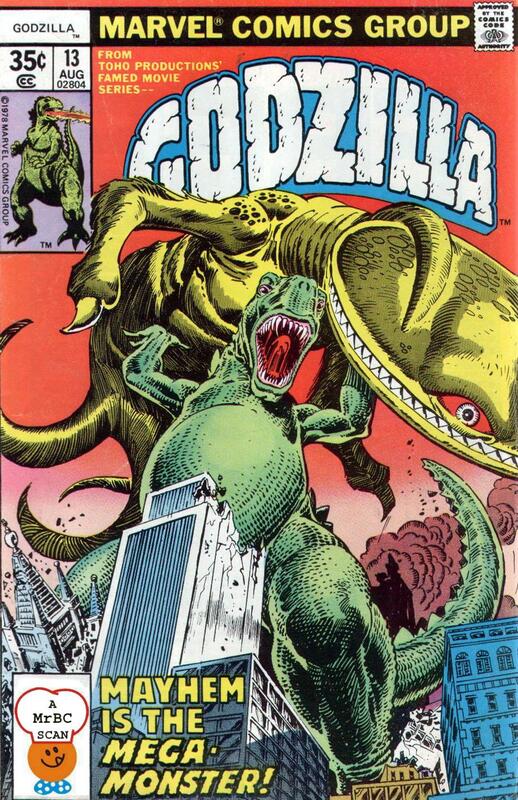 Robert gets over his reluctance to kill because this monster is intelligent and evil. Very convenient! 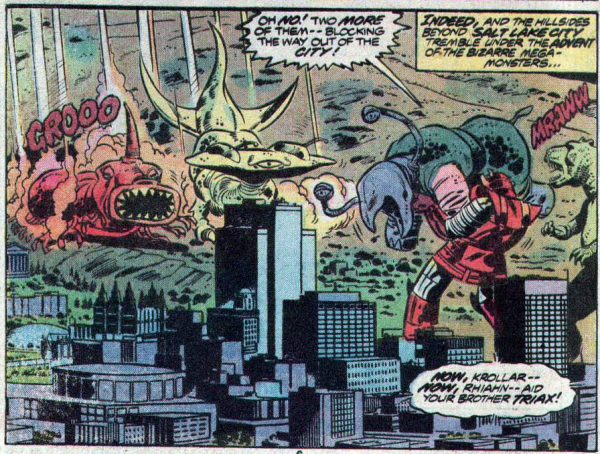 The Megans send the other two Mega-Monsters to help, Rhiahn and Krollar. The Megas declare their monsters are more powerful thanks to their biomech genetic alterations. Triax’s jet feet, Rhiahn’s helicopter tail, and Krollar’s burrowing and super-spitting ability. The truth about the Housing Bubble! The Megan ship Megan Booster-One arrives and plans to zap the Mega-Monsters with the Energex-ray, which will give them ten times their strength but will ultimately kill them. It’s the world’s worst stempack! The Betans expose their secret moon base location in an attempt to intercept the Megan spaceship, the Betan Leader volunteering to fly the ship to stop them. Riahn uses his Anterior Bio-Blade to decapitate Red Ronin! 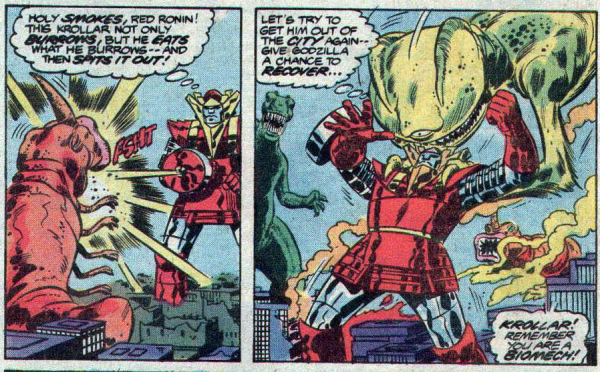 You might say, Red Ronin has lost his head over all this excitement! Not the Energex-Ray! Explain the Energex-Ray! Not the Energex-Ray! Thanks for the explanation of the previous several panels, Red Ronin!